My Torres model is an exact reproduction of the so-called Tárrega guitar (FE 17), which was built by Antoino de Torres in 1864. It is one of his smaller models and counted at that time to one of his ‘better and more expensive’ guitars with an integrated Tornavoz. In my eyes this guitar is something very special. Not only because of its awesome and stylistically timeless look but also because of its impressive history in the relationship between Francisco Tárrega and Antonio de Torres, who formed the origin of the modern guitaristic by their symbiotic and also individual work of a lifetime. The replica of this model is conceived for historically performances of Spanish-romantic literature and develops an exceptional richness in tone colours with many overtones. 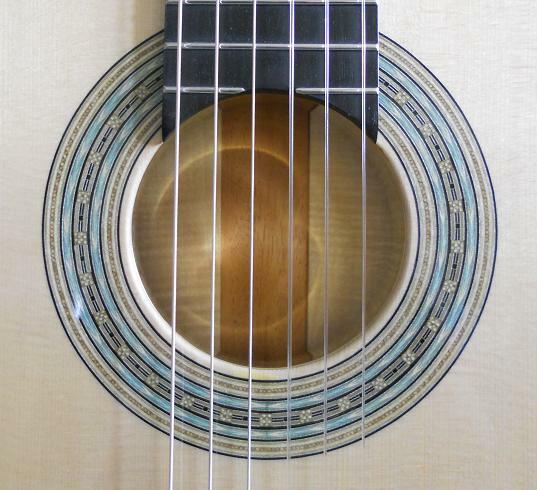 Because of the low tuned body resonance due to the Tornavoz you can clearly realize the charm of the early Spanish guitar sound which manifests itself in warm, round sounding basses and also can be noticed in the trebles. The original strutting of the FE17 was made of the usual Torres – system with seven fanstruts, two V-struts and the open crossbar below the sound hole which I assumed unchanged at my replica. Torres was using a lot of different elements for the design of his rosette. 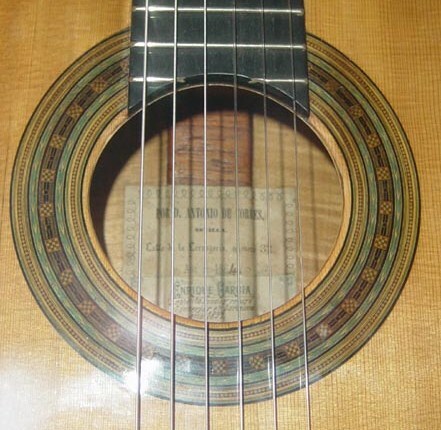 The herringbone pattern is found in a long range of his work and also was used for this guitar. In addition he utilised a central check pattern, as well as a diamond pattern at the edges of the rosette. In preparation of the individual segments the difficulty for me was not only to reproduce them as exactly as possible to achieve the same colouring. The used shade of green was identified by José Romanillos as a stain of copper acetate and was reproduced without any dificulties. A challenge caused with the blue colour of the heringbone pattern, to which no informations was documented and not found that easily. After extensive researches I discovered that in Torres`time the only way to produce blue colours consisted of a treatment of an indigo solution. The complex purflings of the bindings are made of the herringbone pattern which harmonies with the rosette and form a homogeneous composition. The bottom joint is also provided with elaborate inlays. The meander pattern used here has had its ornamental origins in the Neolithic Age (9000-5000 BC) and is based on identically named rivers, winding their way through nature like a snake. The Ribs and Back are also decorated with very wide and beautiful purflings of the half herringbone pattern which generates an impressive appearance. If you consider that this guitar was made in the mid-19th Century, without the availability of machines you can recognize the skilled craftsmanship this master of guitar making must have had. The introduction of the Tornavoz in the second half of the 19th Century was a further innovation of the guitarmaker in search of better and more powerful sounding instrument. They wanted to achieve a better projection without changing the typical shape of the guitar. The term “Tornavoz”, which literally translated means “inverted voice”, describes clearly his intended function. His duty particularly was seen in returning the sound waves back into the body to generate more sustain and a kind of reverb effect. I am exclusively using shellac as finish for the entire instrument which is applied by hand in the traditional technique. Compared to other varnishes shellac offers considerable advantages by leaving only a very thin and protective layer in the method of application which is less confining the vibrations of the top than synthetic varnishes, therefore the guitar is gaining more force of projection. Shellac also has the advantage that it is reversible and very easy to maintain.